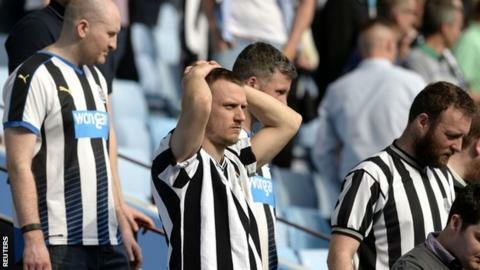 Newcastle owner Mike Ashley "shares the pain" of fans after their relegation but says he will try to "ensure a swift return" to the Premier League. Ashley, who paid £134.4m to take over in 2007, has overseen a second drop into the Championship in seven years. Despite criticism from former boss Kevin Keegan, he will remain in charge. "I've said in the past that when I take on a challenge I am prepared to go through both good times and bad," he said in an open letter to supporters. "I want to assure you that the club will now be doing everything it can at all levels to try to ensure a swift return to its rightful place in the Premier League." Newcastle's relegation comes ahead of an improved Premier League TV deal, worth £5.14bn over three years, which will see the bottom club earn at least £99m. But Ashley, who has previously said the club was not for sale at "any price", defended his commitment to the club, highlighting the £80m spent on players last summer under previous boss Steve McClaren. The former England, Derby and Middlesbrough manager was replaced by Rafael Benitez in March with former Magpies skipper Alan Shearer among those who questioned why the Spaniard wasn't appointed sooner. "We invested heavily in the squad over last summer and again in January, but we have been unable to secure Premier League status despite the recent efforts of the team under the formidable stewardship of Rafa Benitez," Ashley added. "I thank the fans for their passionate support, in particular for Rafa and the team at recent fixtures, both home and away.